Which is best going on holiday by Ferry or Aeroplane? Travelling with kids is generally considered a nightmare. The question is, which is less of a night mare; Ferries or Aeroplanes? I was really nervous of trying a Ferry out considering the disaster of the Costa Concordia and that last time that I went on a school trip and puked the whole way. I’ve had my share of aeroplane disasters though with an engine blowing up, wheel falling off, dropping a couple of hundred feet, and trying to get off a dangerous plane and past the men with guns. It’s not that which really stresses me though. It’s memories of being a teenager with two disabled parents who steadfastly refused help, but took a LONG TIME to get through the airport, so I was constantly panicking that we wouldn’t make it to the plane. (No one told me that once you are booked in they can’t leave without you!). I basically freak from the moment we set off to the airport and don’t settle until we are on the plane. Now that I have kids I freak all the way through the plane journey until we land as well. That’s a lot of freaking! So the ferry seemed like a really good idea. But there was hardly any information about it for a control freak like me and I had no idea how it would work. It’s really easy though: just a pile of different queues. You arrive and queue in the right place for your trip. You can even get out and go to the main building, but I don’t recommend it as several people were caught out as the queues moved. Then you get put in a queue for your car shape and size. Then you started to queue up to go on the boat, where you park in a queue. Remember the level and letter of where you are though!!!!!!! We had a bag ready to take with us, and off you go up to your cabin and the ferry. Wander around for a few hours. Then leave your cabin half an hour before the end and head back to the right staircase for your car. Pop in your car as soon as the automatic door opens, and depending on where your car is, you’re off! 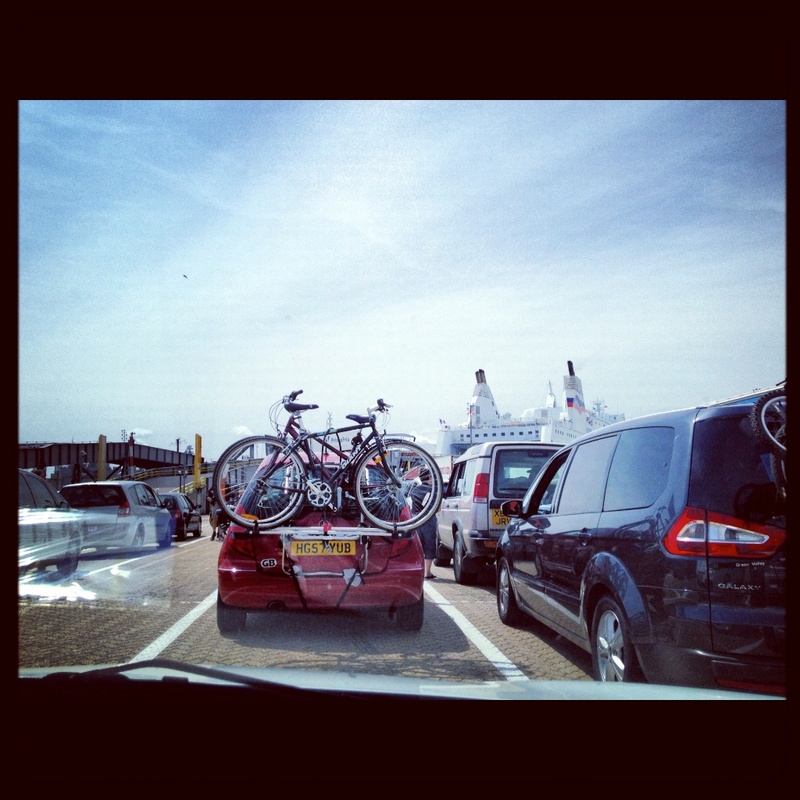 Quicker (the ferry was 6hrs). Heathrow/Luton/Gatwick are nearer to us. Can go further away than just France, Spain or Holland. You don’t get scared shitless by having to walk around the outside of the plane with your two kids! I have puked on a plane, but less often than on a Ferry. Quicker to go to nearby places. No need to park the car. No limit (apart from size of car) on how much stuff you could take: So we had wind break, Boogie board and Radio Flyer! Less faffing around at the airport. No waiting for suitcases afterwards. Things to do on board: Cinema, Soft play, Magician, Dinosaur show. More space: you can even have a cabin with bunk beds that come down from the roof, which was fab. Price: You can probably find cheaper options of both. Customs was quick for us, but slow for one of our friends. Both journeys can take up pretty much a whole day. On the way out I would have said that I’ve come away a lot keener on ferry trips and didn’t puke once (I had some homeopathic pills). From talking to other people, it’s better to go on the slow ferry than the fast one if you are prone to puking! HOWEVER, on the way back it wasn’t rough but it was ‘choppy’ apparently. Well, whichever the way the ‘chop’ was going I was bed ridden for the whole trip and the big hairy northern one tried to brave it out, but because he’d walked around for longer, ended up feeling sick for hours after as well. You DEFINITELY need a cabin when travelling with kids. For the sea sickness I tried homeopathic pills, ginger biscuits and in the past have used those pressure bracelet things. Basically the only thing that helped was keeping my head low and then having some bitter lemon when we left (I had some in my bag, because the bubbles and sugar seem to help me). When we got home I had a pack of crisps; I might like healthy eating, but crisps work a treat for me when I feel sick! Disclosure: I was given a return trip from Portsmouth to Caen with Brittany Ferries as part of a review trip I was doing on Siblu Holidays.